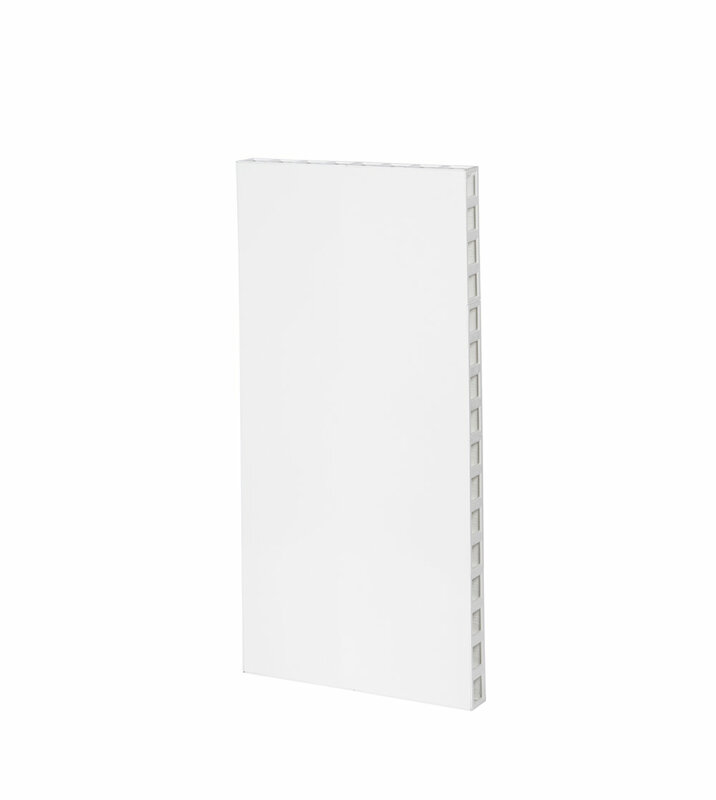 The EverPanel portable wall panel system consists of varying sized wall panels as well as a series of connectors, designed to connect wall panels to each other, and finishing pieces to provide a more finished look. The system also includes a series of accessories, including doors, lintels, and molding for stabilization. EverPanel walls stack compactly and ship efficiently and may be deployed, packed up, and re-used again and again. 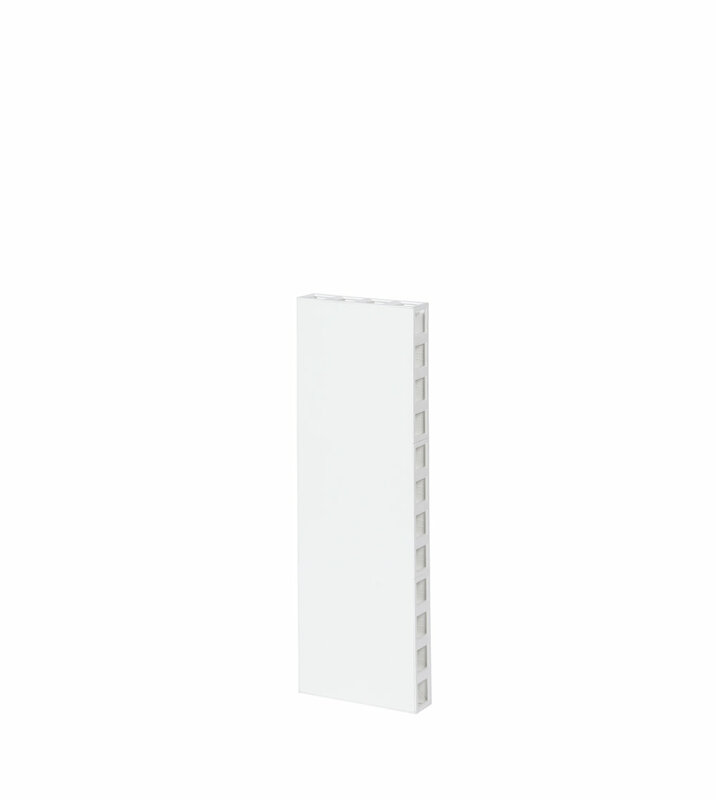 The EverPanel Lug Connector is a specially designs two sided connector that slots into the receiver holes located on all sides of each EverPanel. EverPanel Lug Connectors contain a flange which keeps each lug at the right depth and recesses into the countersink located around each panel receiver hole. When two panels are connected to each other, the Lug Connector is hidden within, leaving no space between panels. This connector is ideal for preventing front to back movement of the panels and friction fits in each panel receiver. Use EverPanel Finishing Caps on exposed panel ends (ends of walls, tops of cubicles, etc) to create a more finished look. Finishing Caps allows you to seal the receiver holes located on the perimeter of each panel. Caps are designed to match the surrounding frame and friction fit into the exposed holes, creating a smooth, consistent, panel edge look. Leave out selective caps as needed for cable management. The Interpanel 2-Lug Connector is used to connect two panels side-by-side. Each connector incorporates two connector lugs which span across two panels and slot into one receiver hole on each adjacent panel. The 2-Lug Connector can be used to connect panels both on the top or on the underside of the panel and is ideal for connecting two walls or columns at 90 degree angles. The Interpanel 3-Lug Connector is used to connect two panels side-by-side with one panel placed in the middle of the two at a 90 degree angle. 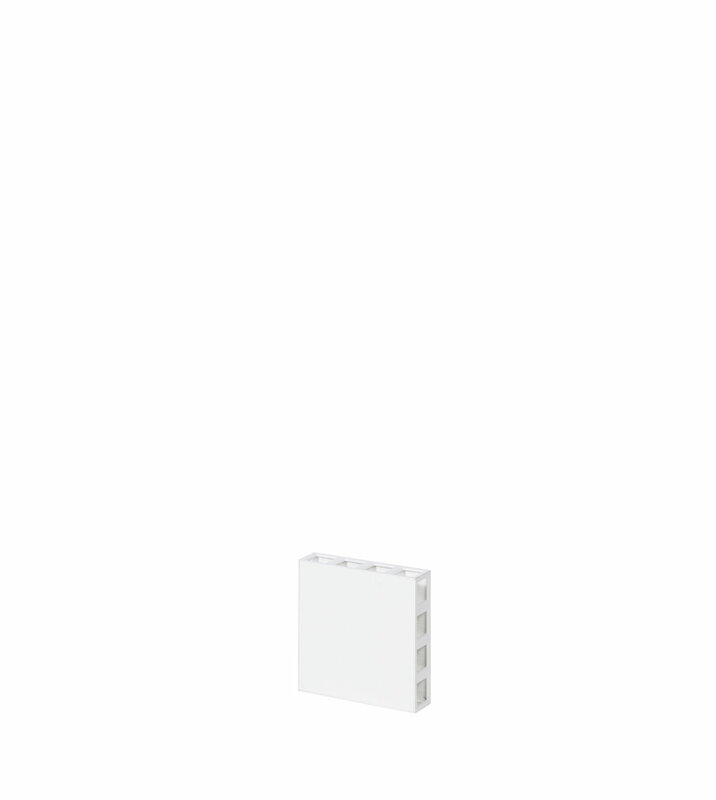 This connector is usually utilized to connect a column panel to two adjacent wall panels. The 3-Lug connector spans the 3 panels and slots into one of the receiver holes on each of the panels, thus locking them all together. 3-Lug connectors may be used on the top of or underneath 3 adjacent panels as needed. 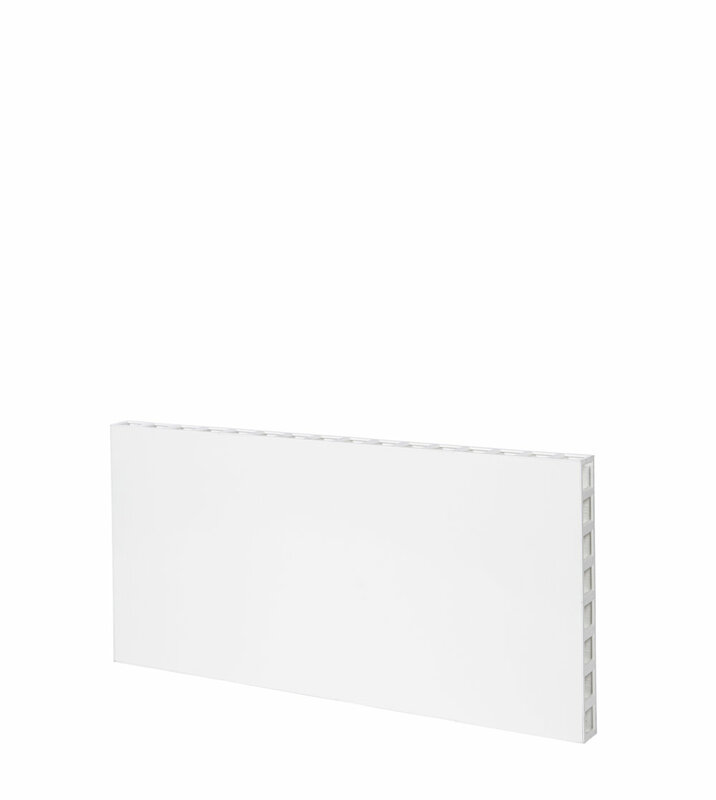 The EverPanel Mounting Cap can be used to mount 3/4” - 1/2” panels on top of or within an EverPanel construction. Use EverPanel Mounting Caps with clear Polycarbonate sheets to create windows or with signage to enhance displays. Mounting Caps snap into place anywhere a receiver hole is located on an EverPanel and can be moved as needed. EverPanel offers 3 Window Panels sizes (1ft x 4ft, 3ft x 4ft, 4ft x 4ft), which may be inserted into an existing EverPanel wall segment, or on top of a standard height or cubicle height EverPanel wall. To create a window insert or decorative wall top, utilize our 1/4” clear polycarbonate sheet, mounted with the EverPanel Mounting Caps, which consist of chrome mounting brackets attached to standard Finishing Caps. Polycarbonate panels are fastened into place by screwing down the mounting screw on each Mounting Cap and then the panel with caps is inserted into EverPanel wall sections by inserting the caps into the receiver holes that surround the perimeter of all EverPanel panels. The EverPanel accordion door is 3ft wide by 7ft tall and consists of a specialized Lintel piece that includes a track for holding our extruded accordion door. Simply slot the folding door into the track and install between two EverPanel walls by sliding the door’s lintel over two connector lugs placed slotted into the two wall panels . Each door includes two thresholds, a double sided handle and and integrated magnet to hold the door in position when closed. The EverPanel L-shaped wall mounting extrusion is used when there is a need to anchor an EverPanel wall to a fixed wall, floor, or ceiling. It may also be used to span a small remaining gap between an EverPanel wall and a fixed wall. Each Wall Mounting L-Channel is 4ft long x 3” wide and 3” deep and installs using standard sheet rock screws into walls, floor, and ceilings, providing a 3” x 4ft section onto which panels may be nested and fastened. 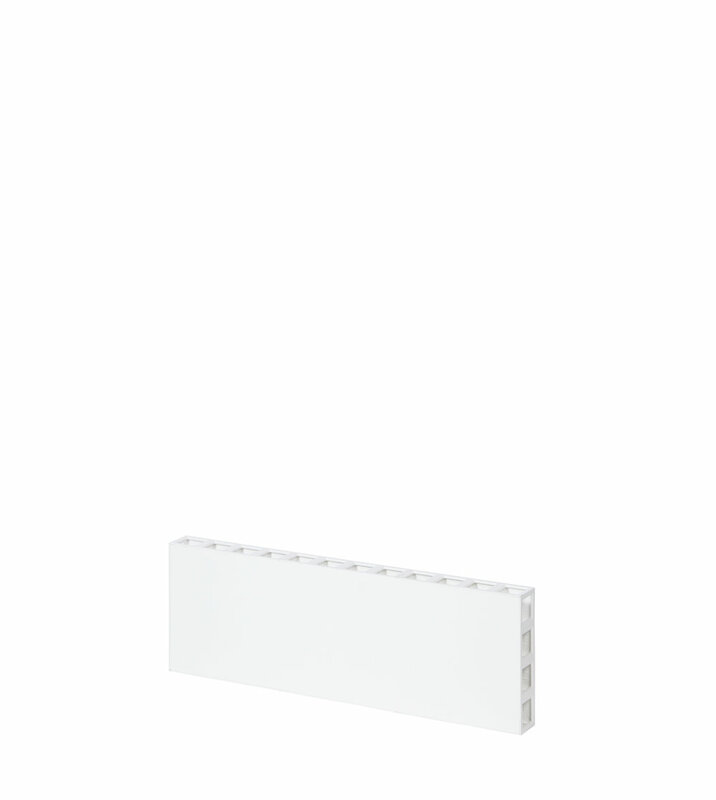 The EverPanel Ceiling Connector Bracket allows you to fasten EverPanel sections to the ceiling, providing greater stability and the ability to free-stand or “float” a wall in the middle of a room. EverPanel Ceiling Connector Brackets snap into the top of EverPanel panels and are adjustable between 4” and 29”. Simply extend the post from the panel to the ceiling and tighten the tightening screw to lock the post in the desired position. Once positioned, the flange top of the post is screwed into the ceiling above. EverBlock decorative blocks are used to add colorful accents to an EverPanel installation. Use EverBlock Line Blocks, Quarter Blocks, and Single Blocks to create beautiful accent stripes above, below, or between two EverPanel’s. The pattern of blocks and combination of colors is limited only by your imagination and there are 3 compatible block sizes and 16 standard colors to choose from to accent your wall. Match corporate or architectural design schemes or delineate areas and room by color. Use EverBlock Finishing Caps to top a cubicle or pony wall when the addition of a color is desired. Use Finishing Caps with EverPanel alone, or with EverBlock Accent Blocks to add interesting color features to your space and to pick up surrounding design themes and colors. Add Foam Insulation Panels to increase both the thermal and sound insulation properties of EverPanel. Foam insulation panels are inserted during the manufacturing process and fit inside the panel, between the outer layers. At the time of order, specify that you would like to add this accessory item and your quotation will be adjusted to include the insertion of insulation panels. Additional lead times may apply.